I had previously started a thread titled Bonsoiree 3.0 to announce that Shin Thompson (chef/owner of what was Bonsoiree) is reconcepting the venue into an Aline Inn inspire venue titled Table, Donkey and Stick. Next month there will be several chef auditions where different chefs will take over the restaurant and prepare a multi-course meal for just $15 (beverages are sold a la carte with some money from beverage sales going to a charity of the chef's choosing). Shin will solicit feedback from diners and is planning on choosing the winning chef at the end of November and hopes to officially open Table, Donkey and Stick in December. Anybody interested in more information or possibly attending one of next month's pop up dinners should "like" Table, Donkey and Stick on Facebook. Shin has already posted information there about the concept of the new venue, the rules for the pop up dinners, and a list of chef's auditioning so far (as of now there are five different chef's announced with the first dinner scheduled for Monday November 5th). For now the first five chef auditions are booked up, but some tables were held back and will be released via their Facebook page and I believe that some additional dinners will be announced for later in November. The seats for the first five dinners were snapped up quickly, so it pays to be vigilant! I managed to snag seats for three of the first five dinners and will report back my experience. Don't use Facebook. Any other method available? We had a bunch of these in STL, when we lived there, so have been looking for something like this here. AMG1026 wrote: Don't use Facebook. Any other method available? We had a bunch of these in STL, when we lived there, so have been looking for something like this here. There is a way to follow via rss but it seems to have a delay. Yeah I just happened to check this morning (a few hours before they even posted on facebook) and found a bunch of reservations open. Table, Donkey and Stick doesn't come up in Facebook when a search is done. Is it out there under that name? John Danza wrote: Table, Donkey and Stick doesn't come up in Facebook when a search is done. Is it out there under that name? Just back from the first pop up dinner at Table, Donkey and Stick; tonight was Chef Keeley's turn (former sous chef at Bonsoiree who also spent time at Blackbird as well as at Toro in Boston, MA). 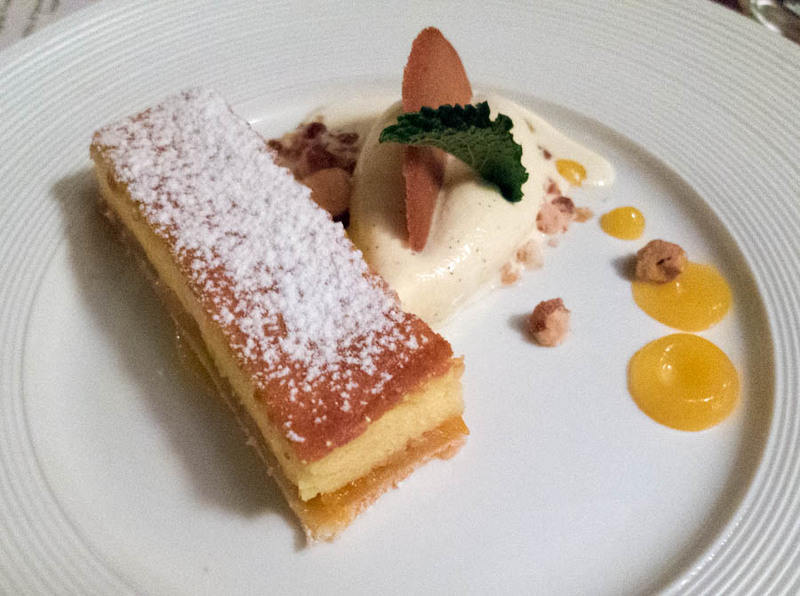 Chef Jon Keeley set the bar high with an excellent five course meal. It was really fun to take part in this experience. For just $15 this was one of the best dining bargains I have ever had (there is special pricing during the competition, but prices will go up once the restaurant officially opens, likely sometime in December). There was a sparkling wine, a couple of reds and a couple of whites available by the glass or carafe (inexpensively priced - we paid $27 for a carafe of red) as well as some after dinner drinks and coffees. Complimentary still or sparkling water is available. There were some minor service issues, but that is to be expected during a pop up dinner such as this where the kitchen is likely extremely busy and it is chaotic for the servers as well with a completely different menu and chef each night of the competition. 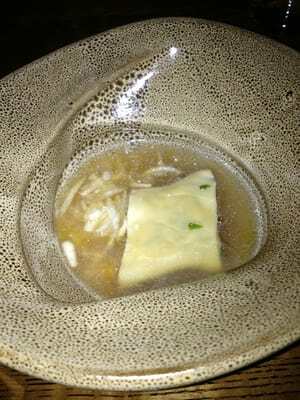 Issues included some lengthy gaps between courses, one of our servers took the time to explain the courses she delivered but the other server simply dropped the dishes off without uttering a word and nobody said goodbye or acknowledged as we left. While this would not be acceptable once the restaurant is up and running, under the circumstances (and price point) it was no big deal. They have someone videotaping the dinners and he interviews select tables (after first seeking permission). The chefs were understandably busy in the kitchen so I did not see any of them mingle with patrons. The food was quite good; I really liked four of the five courses - well prepared, plated, tasty, complex and interesting. The decor has been adjusted slightly from Chef Kim's version of Bonsoiree 2.0 to try and provide a bit of that inn in the Swiss Alps ambiance Chef Thompson is seeking. As with Bonsoiree the venue can become a bit loud when full, but other than that there is a nice vibe.The backyard fire pit was not operating tonight (there is an outdoor area for after dinner drinks around a bonfire that they are planning on having open all four seasons, but they apparently did not obtain wood quite yet - they indicated they hope to have this going on Thursday); that will definitely be a nice, unique feature and a fun way to end a meal. The food was just the right amount; I left feeling quite satisfied, but not at all uncomfortable. I am glad that I signed up for three of the first five pop up dinners and will be returning this Thursday to enjoy the cuisine of Chef Manley (currently of El Ideas); on paper he seems to be the most talented of the five chefs that have been named so far for the competition, but chef Keeley definitely made a strong case for himself tonight. At the end of the meal you are handed a short comment card to rank a few aspects of the meal as well as write in any opinions you might have about the experience. Be sure to follow Table, Donkey and Stick on Facebook as they are quite active with social media and frequently post updates. 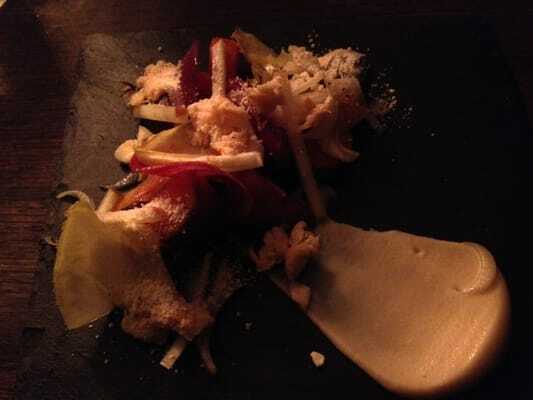 Course #1: Beets, Carrots, Sunchoke Puree, Golden Endive, Compressed Apple, Mascarpone Snow, Poached Trout and Sherry Vinaigrette - An outstanding start to the meal. Beautifully plated and served on slate it was a chock full of bold flavors. This dish makes eating salad fun. Course #2: Charcuterie Plate with Grilled Housemade Pretzel Roll, Pickled Shallots, Bacon-Wrapped Terrine, Rillettes and Pork Sausage - The pretzel roll was so good (I was hoping they would hand out a bag of these as a parting gift, but alas, no such luck). 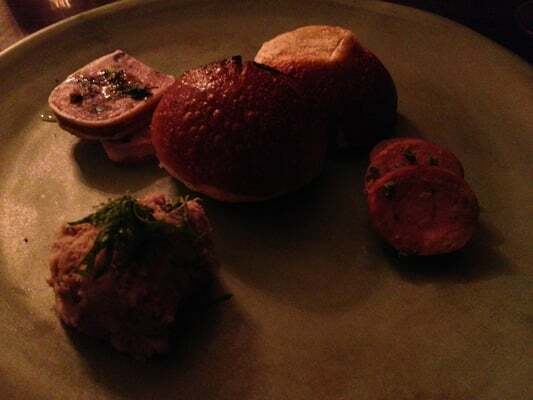 The bacon-wrapped terrine was the best of the meats and the pork sausage was quite good and aromatic; the rillette was just O.K. - not too much flavor. This plate was very good, but would have stood out even more if there was a nice piece of cheese or two. Course #3: Heirloom Squash Soup with Sweetbreads, Crispy Kale, Chili Oil and IPA Foam - For me this was the weakest of the five courses, but my friend really enjoyed his. The IPA foam was excellent, but not enough of it. I did enjoy the soup but the sweetbreads were for me unpleasant (though I have to admit I am not a big fan of sweetbreads in general; occasionally I have liked them but more often then not do not care for them). Course #4: Squid Ink Pappardelle with Braised Rabbit, Rabbit Loin, Brussels Sprouts, Leeks and Toasted Hazelnut Crumble - Excellent dish. 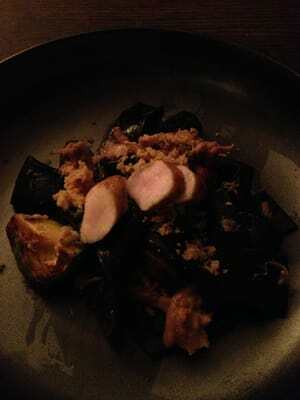 The pasta was well cooked and flavorful as was the two preparations of rabbits. My friend commented that the dish reminded him of a tuna casserole in appearance (the hazelnut crumble resembles the crust on a tuna casserole) and we then noticed that the squid ink imparts a bit of a fishy (but very pleasant) aftertaste - so if one did not know this was rabbit they might actually think they were eating a fancy, upscale tuna casserole. This dish was excellent and definitely is one that would likely do well were it (or something very similar) to make the final menu. 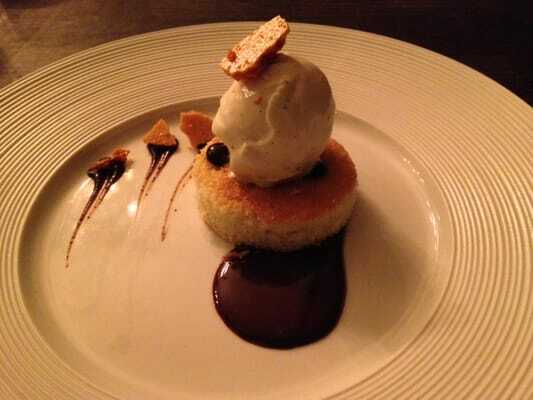 Course #5: Olive Oil Cake, Creme Fraiche Ice Cream, Espresso Gel, Honeycomb, Ganache - A great end to the meal. While the cake itself was a tad dry, everything else was so potent and moist that it did not matter. I am not generally a fan of creme fraiche, but this was some outstanding ice cream and tasted more like really flavorful vanilla than sour cream. The honeycomb candy crumble was one of the best parts of the meal; like the pretzel bread I would have loved to take home a bunch of this treat! 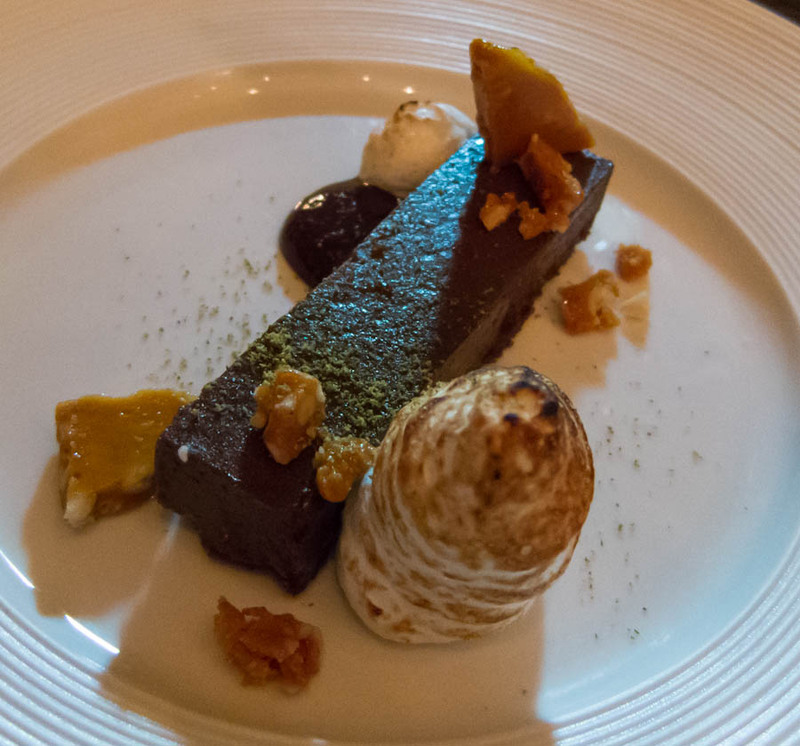 The espresso gel and ganache also added interesting textures and flavors. It will be interesting to see how everything plays out at Table, Donkey and Stick. Chef Thompson has really come up with a unique, interesting and fun way to choose a new chef and has created a lot of positive buzz. I think this venue has a lot of potential and hope it is successful. I will try and report back after my meal on Thursday! Tonight was round two of Table, Donkey and Stick's pop up chef audition dinners; at the helm tonight was Chef Scott Manley (currently one of the chefs at Phil Foss' El Ideas). El Ideas is one of my favorite restaurants so I was familiar with Scott's cutting edge cuisine and had high expectations. While the meal was quite good, I have to say that overall I have to award a slight edge to Jon Keeley. It was not at all that Scott disappointed, it was just that Jon's meal was that good. Scott took a slightly different approach; there were six courses (versus five with Jon); the first two courses were both quite similar and I feel should have been combined into a single course; they each featured a shared plate of a couple slices of housemade rye bread and a meat spread (the first course contained boar rillettes and the second duck). The plating was unimpressive for these courses so it was not the best start to an otherwise solid meal; there just was not much going on presentation or flavor wise. 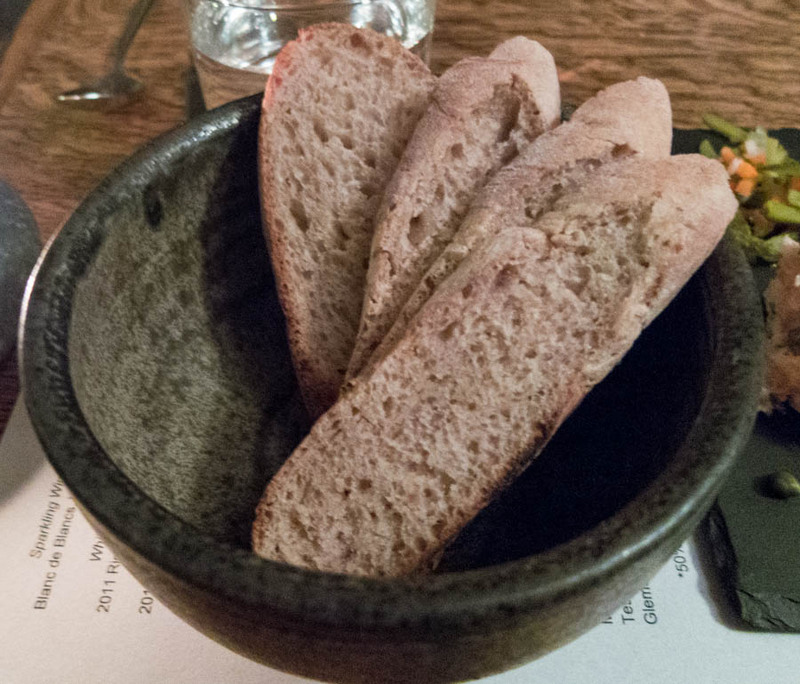 The texture and taste of the boar rillettes were subpar (we left some unconsumed) and tonight's bread was nothing like the wonderful homemade grilled pretzel bread on Monday. The duck was superior to the boar, but was not up there taste wise or presentation wise with Jon's nicely composed Charcuterie plate on Monday. Fortunately Scott elevated his game on the next four courses. 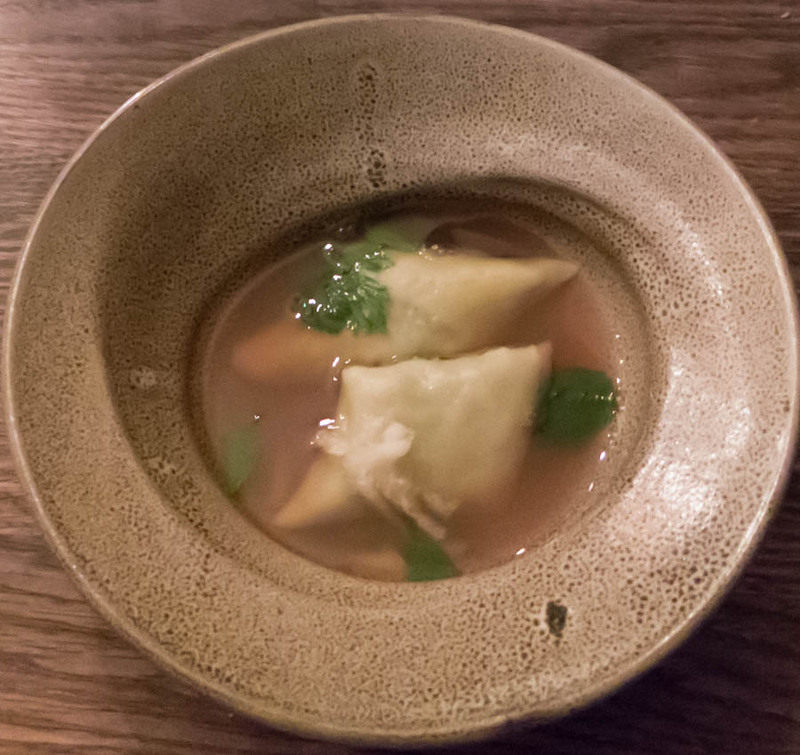 Scott scored a small victory versus Jon on the soup course; tonight the soup consisted of a chicken consomme with smoked chicken maultaschen. The smoked chicken was excellent; very flavorful, moist and a pleasant smoky aftertaste. The broth was nice as well, but just a tad over salted. Not the most complex course, but very tasty. This was followed by a very nice entree, but fell a little short from Jon's phenomenal squid ink pappardelle with braised rabbit. Scott had butchered a boar for the main protein on tonight's dinner and the entree consisted of two preparations of boar (sausage and I believe the other was from the shoulder) and was accompanied by red cabbage, bubespitzle (like a delicate gnocchi), celery and ginger snap crumble. 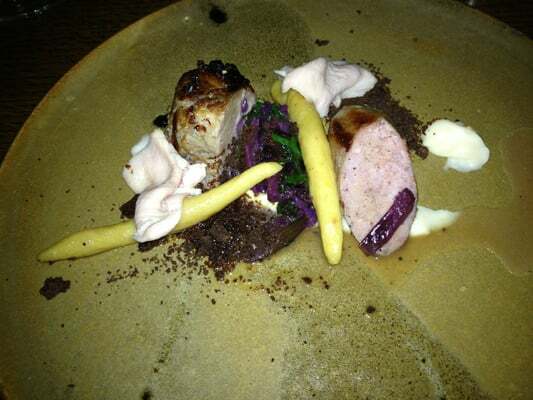 This dish was more far more interesting and complex than his first three courses and had excellent taste and texture combinations; the ginger snap crumble really was a nice addition and I loved the boar sausage and the nice sour cabbage. 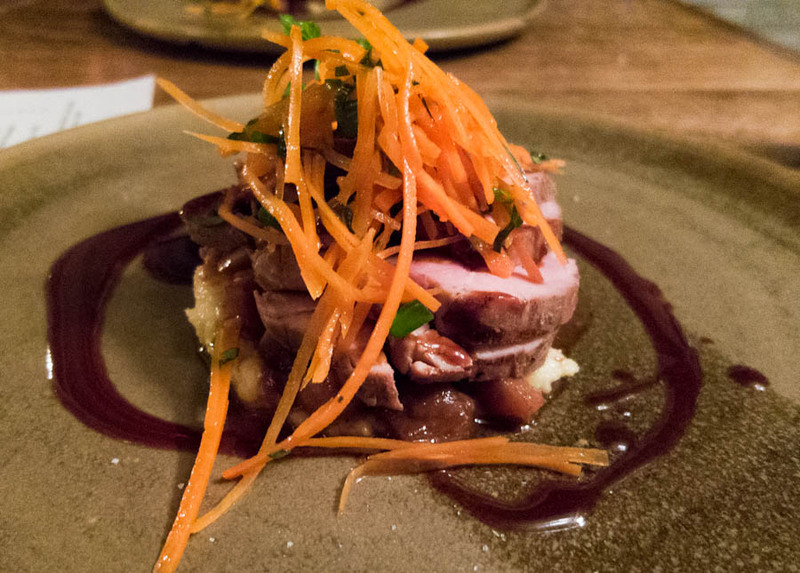 The boar was flavorful, tender and not overly gamey. A big plus for Scott was a cheese course in between the entree and dessert. Cheese was absent from Jon's meal and that was one of the few negatives of Jon's progression. I had never heard of the cheese before (Maxx 365) and our table was trying to guess what it was before it was served; the best we had come up with was perhaps it was the name of the boar that had been butchered. 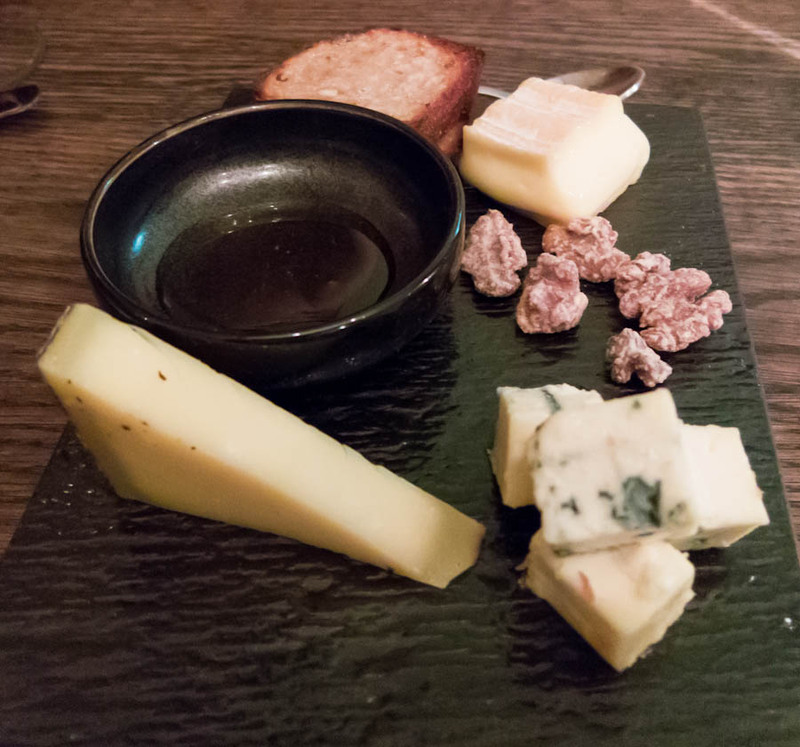 We were pleasantly surprised when a cheese plate was delivered; the cheese hails from Switzerland and believe or not is coincidentally aged for 365 days! The cheese was absolutely delicious and was accompanied by chestnuts, delicate squash and pepitas. The dish had a very sweet aftertaste that transitioned well into to dessert. Like the entree this course was much more interesting than the first three courses of the night; the cheese was so good I plan to see if I can find some to purchase. 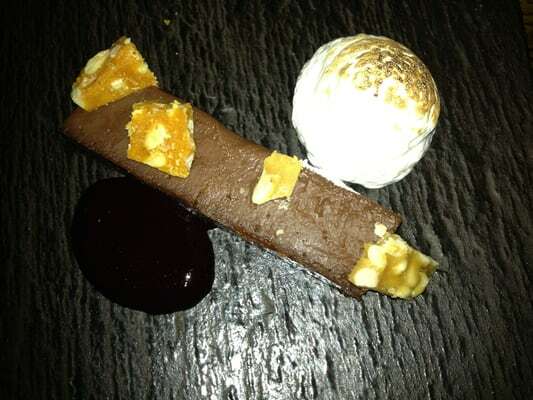 Dessert was a chocolate pave with a meringue made from the sap of a pine cone; the chocolate was topped with a pine nut brittle and there was a small pool of blueberry sauce just off to the side. This was a very nice dessert, but again I just slightly preferred Jon's; this likely was mainly a personal issue (I am not a huge fan of chocolate desserts); the other three people I was with all loved the dessert. Tonight I was seated in the back room; this was my first time ever being in the back of my five total meals in the Bonsoiree space (two under Chef Shin Thompson, one under Chef Beverly Kim and now the two pop up dinners). I actually really enjoyed the more modern backroom to the front; there is a cool gas (or possibly propane) fireplace built into the wall and two of the walls have floor to ceiling windows looking into the nicely landscaped backyard. The only negative of the back room is that it is even louder than the front; I definitely think management needs to try to do something about the noise level as it is unpleasant and detracts from what should be an intimate, upscale dining experience. There were some similar to be expected service issues tonight as with Monday, but again with this being a series of dinners where each night there is a different chef running the kitchen and completely different menu this is understandable (issues included long gaps between a couple of courses and again some courses were dropped off sans any explanation). A nice touch tonight that earns Scott some points over Jon was that Scott himself delivered two of the courses and did describe them and answer questions; this was impressive that despite a full house and the first night serving this menu he had the time to make rounds. Shin was also far more visible tonight and also delivered food to some tables, though not to ours. Separate from the competition, there were two more nice additions to the restaurant tonight. They have expanded the beverage list including two beers (Schneider Edelweiss from Germany and Hirter Worchl from Austria), added a second cognac and some brandies from Koval Distillery. Also the much anticipated fire pit in the back yard was operational tonight; Shin himself built the inguinal bonfire. 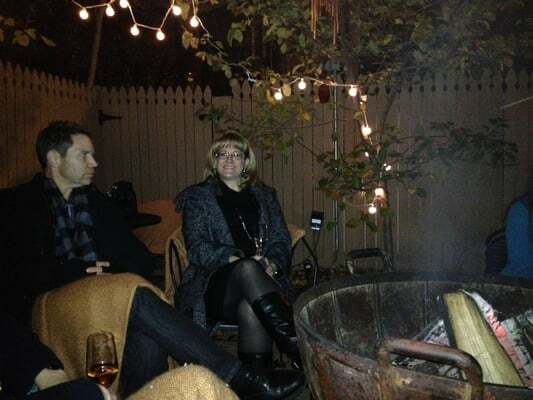 The outdoor is really pleasant; there is some trees, lighting adorning the fence, the fire pit in the center of the patio and several chairs with small tables for cocktails or bites. The chairs even had blankets draped over them to help you stay warm. I believe they are planning on having this space available year round, but I think once it gets into the twenties outside it might be too unpleasant despite the fire to be outdoors for long. It should be a great asset for at least eight months per year though. A nightcap around the fire was a great way to end a fun evening; I will be back next week for the Wednesday meal, but will not be at Monday or Tuesday's. Apparently there will then be two more meals later in the month that have yet to be made available (so keep watching the Table, Donkey and Stick Facebook page if you want in)! Jon and Scott have really started the competition off nicely and I am loving Shin's new concept; everything is looking really promising. Congratulations to Chefs Jon and Scott on a successful week one and best of luck to the chefs competing next week. I didn't get to go to the first meal, but I had the meal last night and I wasn't wow'd. 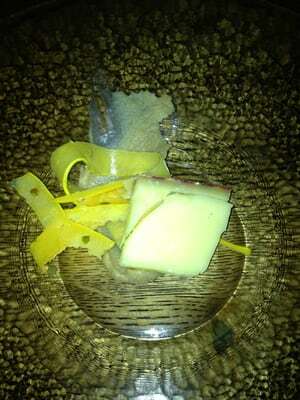 The cheese course was a perfect example- we had to use our smartphones to figure out anything about the cheese. Same goes for pretty much everything else we ate. The cheese itself was very good and strong and didn't work well with the very starchy accompaniments. The tart blueberry from the dessert would have worked better or the rye from the first course with the cheese, but I even more would have liked to see some alpine berries. There were problems with some other courses as well, like the blob of collagen in my pork and the unbalanced musky favor of the duck liver pate. Good to know; I was not aware of this. Is he working anywhere at the moment? They released seats for the 19th, but they are gone now. I had Sean O'Hara's menu last night and it was better than the Scott Manley menu I had, but honestly not be much. 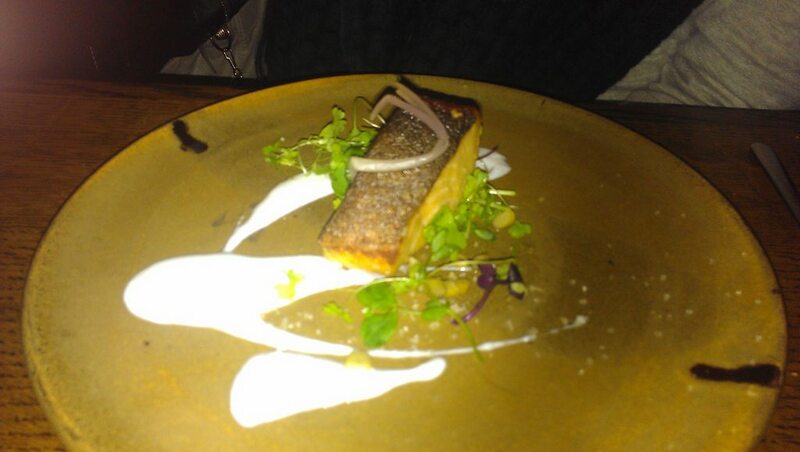 and the trout with the perfect soured goat milk accompaniment, though I couldn't taste some of the other elements (morel salt, pickled ramps/scales, wild herbs) at all. 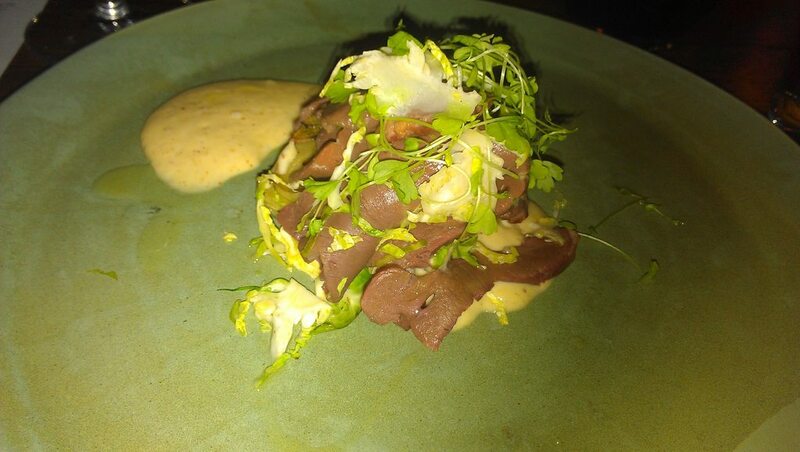 I did like the warm beef heart, it was good, but it was kind of a heap of heart covered in cheese without much to cut the richness. 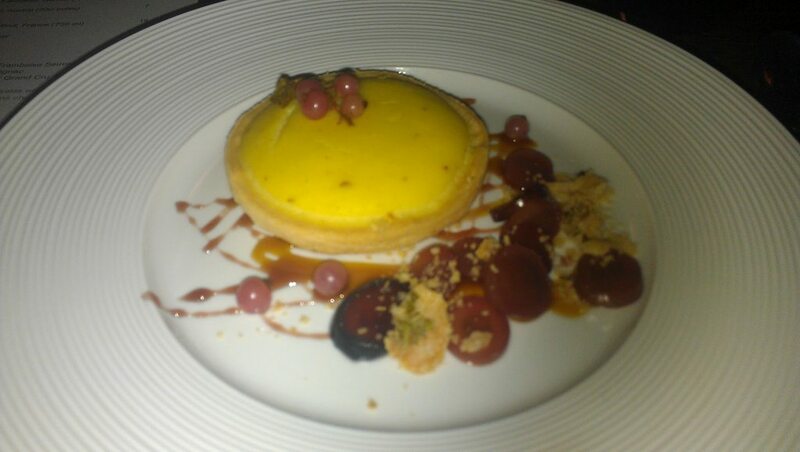 The strangest dish was the Beaufort Tart with pickled currants and grapes. It is very hard to describe. Almost everyone agreed it was intriguing, but not delicious. It had a pronounced aged cheese flavor with elements of dill and the pickles made it taste even stranger. I am a huge fan of savory desserts, but this one did not make the cut. My curiosity was piqued though and I am interested to try to make this dish at home to see what it is supposed to taste like. I attended my third of the pop-up dinners tonight and was run by Evan DeVries. Tonight I was just in the mood to relax and did not end up shooting any photos, but this had nothing to do with the quality of the food or the plating; the presentation tonight was actually the most attractive of the three meals I attended and the quality of the food was nearly equal with Chef Keeley's meal with Chef Manley's meal being the least favorite of the three (though still good). Tonight's meal had a nice progression of courses; charcuterie plate with homemade sourdough rye bread, cheese soup, frisee salad with poached egg, palate cleanser, cured pork loin entree and dessert. While Chef Keeley's charcuterie plate and salad and entree were all superior, Chef DeVries' soup and dessert were better and the entree came close to Chef Keeley's. 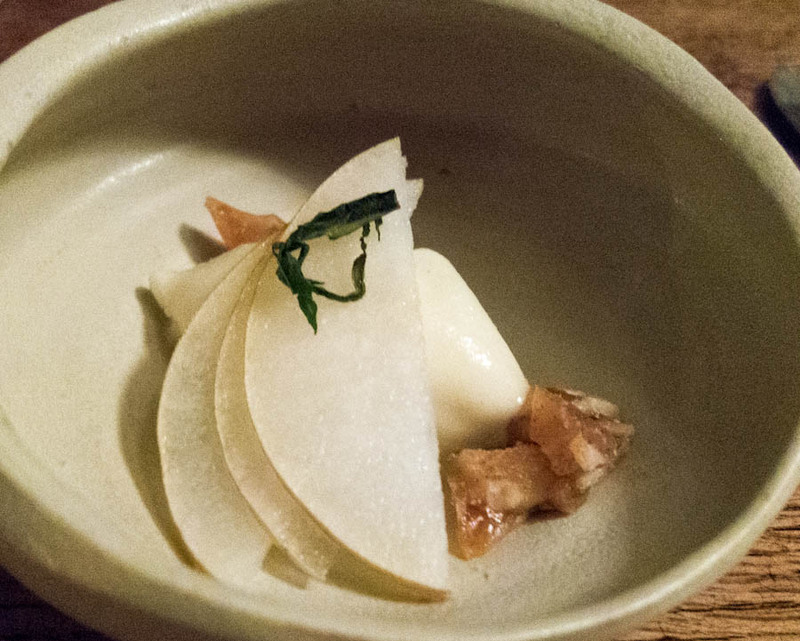 The intermezzo was also a nice touch, some very flavorful pear sorbet with cardamon and some delicious honey coated walnut brittle; the sorbet was great but the brittle was the star - I would seriously pay for a bag of the brittle! Another nice touch was some homemade hot chocolate at the end of the meal; we took ours out by the bonfire and the hot chocolate was rich and tasty and made for a nice end to a fun evening. Tonight I was joined by a friend from my running club, a friend I met through the Next restaurant Facebook community and the chef/owner of one of my favorite restaurants; all of us really enjoyed the meal and dining experience. Service even was better than the first two meals; I am not sure if that had something to do with Chef DeVries or if the staff is just getting the hang of the pop up dinners; the pacing was better and all but one course was explained. The one aspect where Chef Manley was tops was visibility; he was the only of the three chefs to come tableside and present some of the courses, but Chef DeVries wins presentation and Chef Keeley just very narrowly eeks Chef DeVries for food quality - but that is nearly a tie. These pop up dinners have been such a fun experience and have definitely generated some positive buzz for the restaurant and likely garnered some future patrons. I am hoping to scores seats to the final pop up dinner this upcoming Monday, but missed out on the first batch of tickets. If the meals this Monday and Tuesday (I did not attend these) were anywhere near as good as the three I did attend then Chef Shin and partner Matt Sussman will have a very difficult time picking a winner - though having to choose from several strong candidates is not a bad problem to have. I look forward to seeing how everything shakes out at Table, Donkey and Stick. Thank you Chef DeVries and the entire staff for another wonderful dinner. Shin just tweeted "Scott Manely" (sic). Not sure if that means he's the guy? claypoolfan wrote: Shin just tweeted "Scott Manely" (sic). Not sure if that means he's the guy? I doubt it since there is still one more dinner next Monday. But you never know. I thought dinner last night was really fantastic and much better than the dinner on Monday. Pictures forthcoming. Just a guess, but maybe he is about to release video of Scott's pop up dinner. As I stated above, I really enjoyed last night's dinner and thought it was much better than Monday's (when I forgot my camera). Although those were the only 2 I've been to (so far) I really hope that Evan DeVries gets the job. 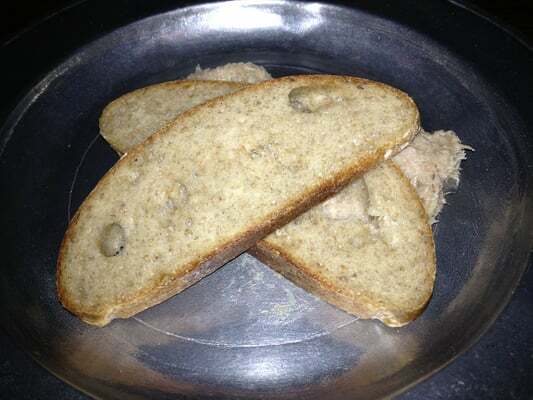 The first course was the requisite rillettes/bread course and was very good. The smoked salmon was truly fantastic and the pickles were very well done, as well. 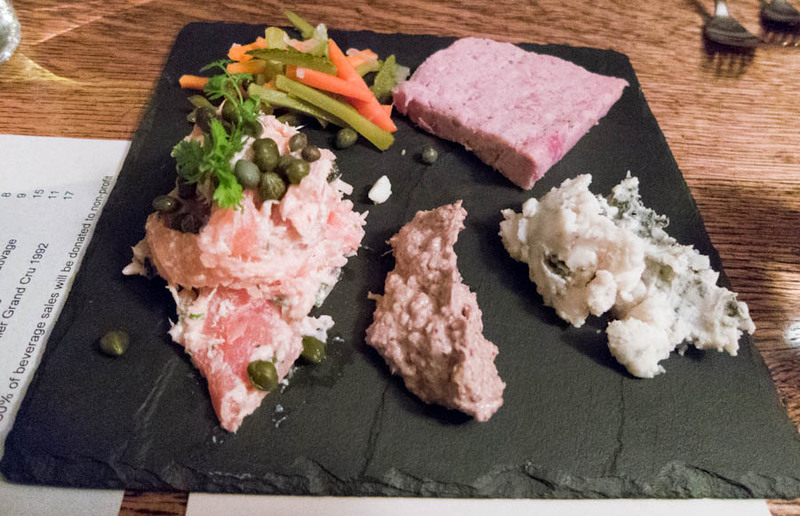 I liked the Roquefort that was paired here as well and think it did a nice job complementing the rillettes. I will say that I have no idea where the hard-egg was, but it was not missed. This was amazing. 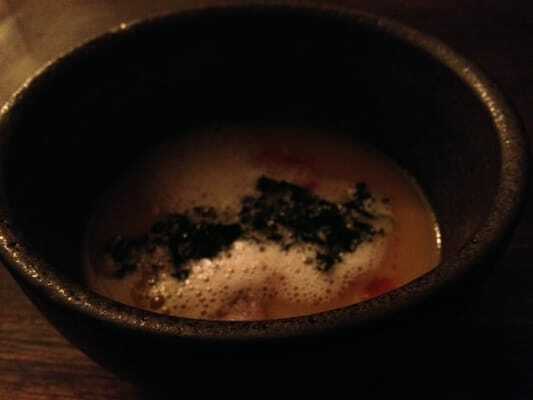 One of the best soups I've had (up there with the celery root soup from Elizabeth). 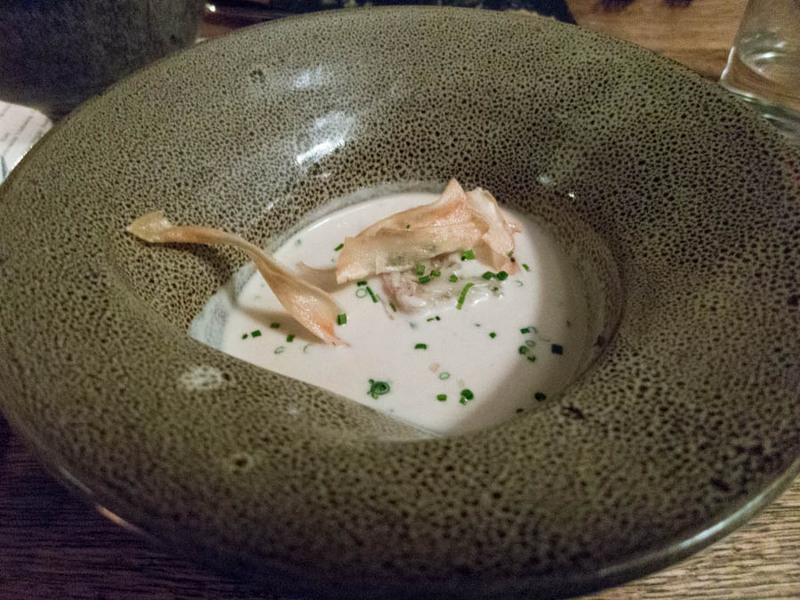 A great flavor and very nice texture with the contrast between the silky soup and the crunchy salsify chips and the bright bursts from the tiny pickled shallots. A very nice salad, although a little boring. A very nice intermezzo. I believe there was some sort of walnut brittle here that was really great stuff. Keeping with the theme of the evening, this was another fantastic course. I though the flavor of the pork was terrific and it was cooked perfectly. My only comment is that I feel it could have done without the apples and with a lot less carrots (there were a lot). Although the menu on grubstreet/facebook said it was vanilla rum, I believe it was in fact vanilla bourbon ice cream (I forgot to grab a menu on the way out). Either way, it was amazing. I was contemplating licking the remnants of the melted ice cream off my plate when I finished it. The tart was very nice, as well, but I felt that the ice cream was the real star here. Overall an amazing dinner and an incredible value. I would have been comfortable paying 3-4 times as much as I did. I'm excited for the last pop-up dinner on Monday but this is going to be a tough act to follow. I get that it might not have been exciting, but I have to say that I'm a sucker for a well-made Lyonnaise salad. 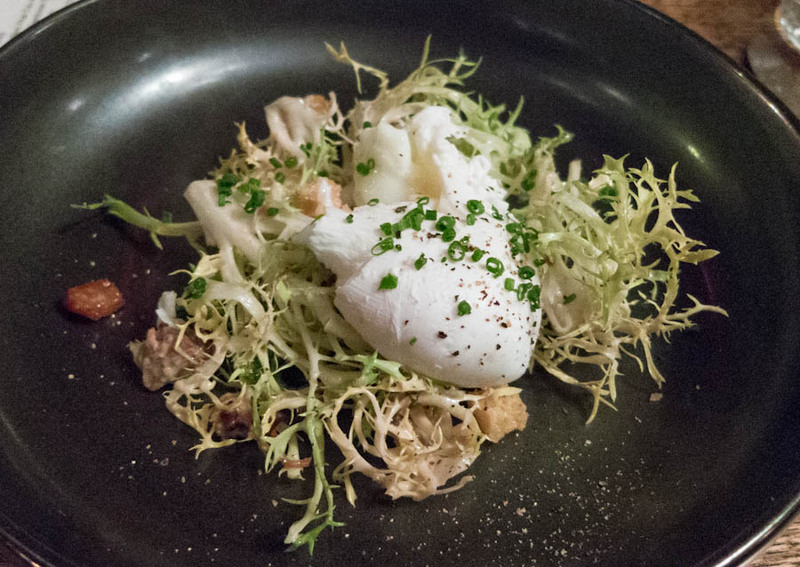 To me, the combo of a beautifully poached egg, lardons and frisee is just about perfect. While I wasn't a fan of the actual meal I had of his, I think a lot of it was the service that night and I know they put a lot of stock into the menu concept and his menu was certainly the one that looked the best. I'm a big supporter of whole-animal butchery in restaurants, so I'm happy he won. I love Scott Manley's cooking and even though I didn't have any of the "audition" meals, I'm pleased that he won the gig. It's very likely to get me to return to a place that I had entirely written off. Now, I feel there's a solid reason to return. Had the preview dinner last night and I was pretty impressed. I think I still preferred the dinner that Evan DeVries did but this was very good. Please forgive the quality of the photos as I came straight to dinner from a bar crawl. A very nice charcuterie plate. I really enjoyed the the galantine and the baguette was quite nice. This was probably my favorite of the night. The bacon was really fantastic and i felt everything just sort of came together here. I especially liked the mustard seeds strewn about. This was someone else's appetizer and the small taste of the maultaschen I was afforded was quite tasty. I really enjoyed the subtle, somewhat sweet flavors of the sausage complimented by the acidity from the dressing on the cauliflower. The pretzel was very nicely done but not entirely necessary for the dish. A nicely done cheese plate with some good honey accompanying it. Honestly at this point I was stuffed but this was a nicely composed dessert and I especially enjoyed the blueberry sauce. I enjoyed the dinner I had last night and even before it was discounted to the "get-to-know-the-neighborhood" price it was still quite reasonable. I'm excited to return once chef Manley has put out a full menu. 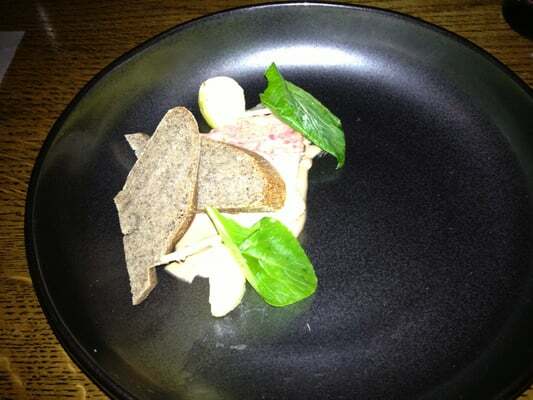 Had dinner at Table, Donkey, and Stick last night and came away fairly impressed. Started with the Hop Haus which is a vodka tonic that uses Hophead Vodka and Fentiman’s Tonic. Hophead Vodka is made by the Anchor Brewing Company and uses hops in the distilling process. It gives the vodka an interesting, aromatic quality. I am typically not a vodka fan, but I quite liked this drink. My friend and I ordered some of the charcuterie and cheese. 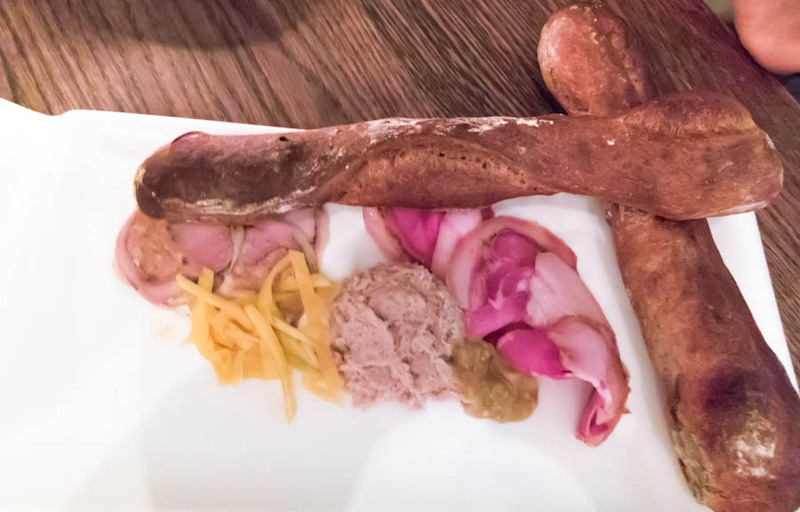 I liked the smoked venison loin and the cured pork loin well enough, but, for me, the highlight was the pork rillette that came with the house baguette. I believe the rillette and baguette were complimentary as we didn't order it, and I saw this brought out to most tables. We also tried the Carboncino cheese which was a nice, earthy goat cheese. This was followed by a few small plates. The first was the polenta with roasted bacon, gorgonzola, pickled peppers, and black trumpet mushrooms This was an excellent dish. 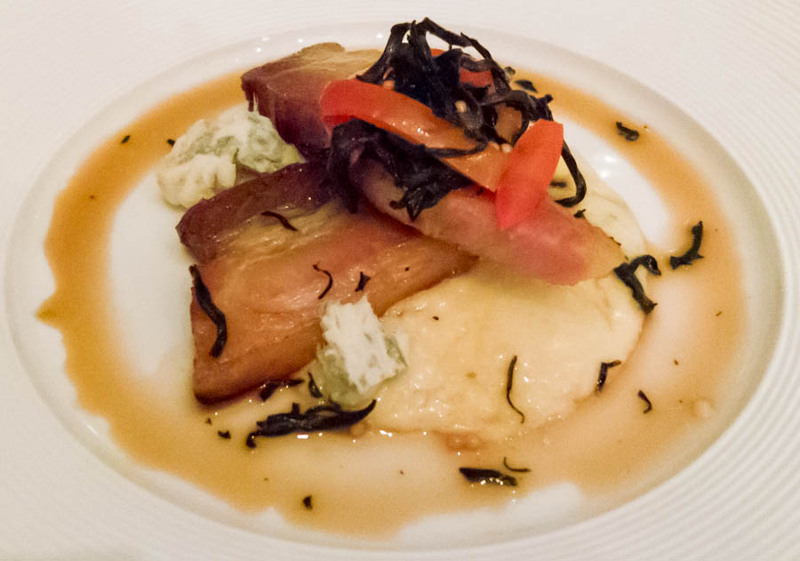 The bacon was smokey, crisp, and delicious and was complimented perfectly by the texture of the creamy polenta and the bite of the gorgonzola cheese. We also ordered the roasted sunchokes and squash. I was not a fan of this dish. 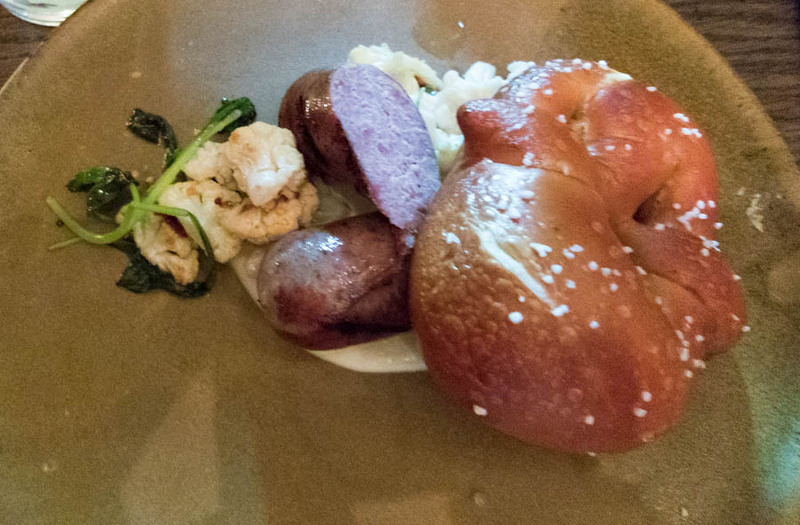 We then split one of the larger plates, the pork sausage and pork fat pretzel with cauliflower and mustard butter. Not quite sure why the cauliflower was there. It wasn't bad, but it didn't really add much to the overall dish. However I was a big fan of the sausage and the pretzel. I could have kept eating that. All in all, I quite enjoyed Table, Donkey, and Stick. Nice drinks and good food. I thought the price point was very fair. Good addition to the neighborhood. One observation is that I wish they had a bar. I live in the neighborhood and could see myself stopping in for a drink and some dinner, but it would be nice if they had a bar to sit at to accommodate the solo diner. There are some communal dining tables in the back that are perhaps intended to serve this function, but I guess I am a fan of more traditional bar seating. Chicago burger lovers have yet another excellent burger option thanks to Table, Donkey, and Stick. The "Alpine Burger" is a double cheeseburger with butterkase cheese and onion marmalade, all served on a pretzel bun. The beef was well-salted and juicy. Our server didn't ask for a choice of temperature and mine came close to medium while my dining companion got one much closer to medium rare. The burgers are served with miniature latkes along with horseradish aioli and apple mostarda. I'm not sure where the line between hash browns ends and latkes begins but wherever these fall on that spectrum, they were really good. So good, in fact, that they rendered the aioli and mostarda irrelevant. The burger is $15. On Wednesdays, that same burger will also get you a beer and a shot of bitters (served with an optional glass of soda water). You don't get to pick your beer and you get a choice of two bitters (there are several on the menu for those who want to buy additional shots). Table, Donkey & Stick has been open only 14 months, but it's already closing for a makeover. Named one of Chicago magazine's 2013 Best New Restaurants, the Alpine-influenced, charcuterie-focused, 50-seat spot in Humboldt Park will go dark on March 23 and reopen April 3 with a whole new look in the front room.